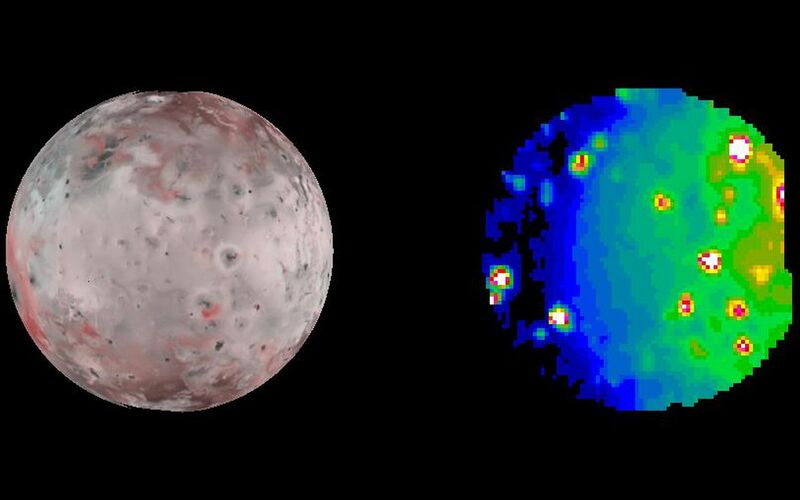 Hot eruption sites scattered across Jupiter's moon Io stand out dramatically in an infrared image taken Oct. 13, 2001, by NASA's Galileo spacecraft as it sped past this most volcanically active of all known worlds. 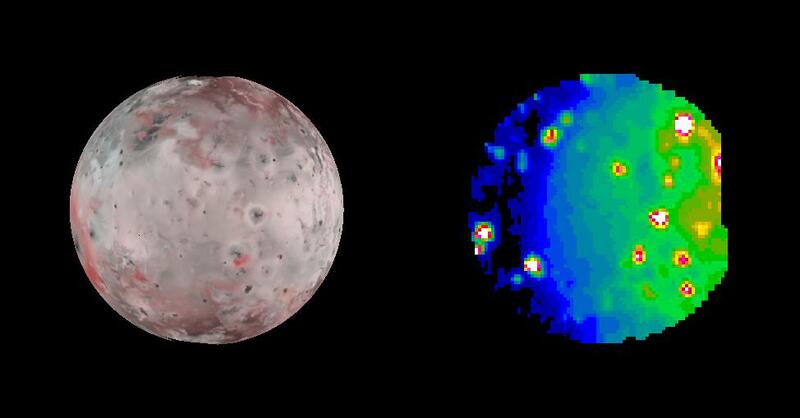 The infrared image (right) serves as a thermal map to nearly a full hemisphere of Io. 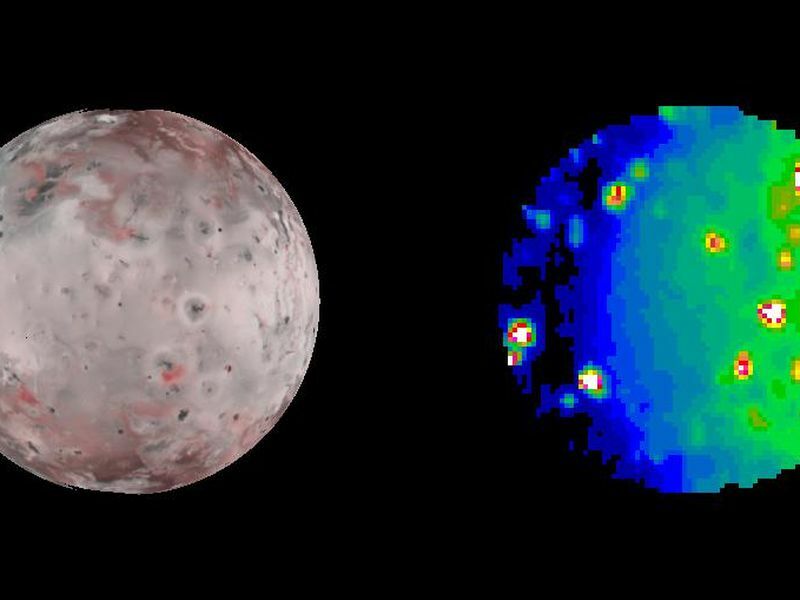 An image from Galileo's camera showing the same face of Io (left) is included for correlating the heat-sensing infrared data with geological features apparent in visible wavelengths. When Galileo snapped the infrared shot, the left half of the hemisphere was actually in darkness and the right half in daylight. The infrared image uses false color to portray the intensity with which the surface glows at the invisible wavelength of 5 microns, as observed by Galileo's near infrared mapping spectrometer instrument. White, reds and yellows indicate hotter regions; blues are cold. The resolution varies from 83 to 93 kilometers (52 to 58 miles) per picture element. Four previously unknown volcanoes have been discovered from this image, including one also detected in another infrared image taken the same day. Those new-found hot spots are faint. Among the more easily identified brighter volcanoes in the image are the pair Pillan and Pele located near the left-hand edge at about 8 o'clock if the circular image is taken as a clock face. Marduk is located a little farther from the edge at 7 o'clock. The bright spot at about 2 o'clock is the site where a plume was seen erupting about 500 kilometers (320 miles) high 10 weeks before this image was taken. The Jet Propulsion Laboratory, a division of the California Institute of Technology in Pasadena, manages the Galileo mission for NASA's Office of Space Science, Washington, D.C. Additional information about Galileo and its discoveries is available on the Galileo mission home page at http://solarsystem.nasa.gov/galileo/.